Most log home enthusiasts understand the benefits of thermal mass in storing and release heat within the logs themselves. It’s one of the reasons log homes feel so comfortable. So what if you could enhance that thermal mass element in your log home? Some engineers have come up with a nifty new way to retain excess heat and release it slowly during the evening. 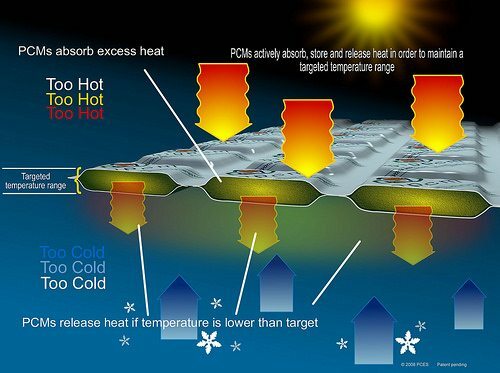 Phase Change Energy’s Bio PCM actively absorbs, stores and releases heat to maintain a targeted temperature range. The material, which comes in sheets that resemble oversized bubble wrap, uses the process from physics called “phase change” to store and release energy. A phase change is the transfer of energy when, for example, an ice cube melts. In melting, the cube absorbs energy and when it freezes again it releases energy in the form of heat. The Bio PCM material is made of a blend of palm and soybean oils and is preset with a target temperature. When the adjacent space becomes warmer than the target temperature, the Bio PCM will absorb and store the energy by changing from a solid to a gel. At night when any solar heating is completed, the material slowly releases the stored energy as heat to maintain the target temperature, changing back into a solid. This temperature optimization can allow homeowners to downsize HVAC units in their homes, and save as much as 30% in heating and air conditioning. Bio PCM is available in three standard centigrade degree melt points: 23, 25 or 29 (73.4, 77 and 84.2 degrees Fahrenheit respectively), with custom melt points available. BioPCM is available in four thicknesses that correspond to pounds of active component per square foot, from ¼ inch to one inch thick. Additionally, the material can be applied in targeted areas, where too much heat might be generated from solar or cooking, and added in other areas where exterior temperatures might be colder than ideal. For example, a vaulted purlin room area with a wall of windows might get too warm on a sunny day. Bio PCM material applied to adjacent walls (under the interior tongue-in-groove layer in Katahdin’s Energy Envelope System) could absorb and store that extra heat, releasing it during the cool nights. With appropriate modeling, Phase Change Energy engineers have been able to configure Bio PCM enhancements with enough impact for immediate return on investment when mechanical systems are reduced in size and cost. BioPCM has been installed in a diverse range of commercial and residential buildings. However, according to Sam Cremins of Phase Change Energy Partners, one of the most notable installations of BioPCM this year was a passive house built in Carmel, Calif. “After the rough plans had been done, the builder had found that they still needed to improve the building envelope and were pressed for space,” Cremins explained. “The choices included a double density closed cell foam insulation or the addition of phase change material that cost $1,500 less. They chose the bioPCM.” This LEED Platinum home won the Best New Home Award from Fine Home Building Magazine. Generally, Bio PCM is easy to work with: the rolled sheets can be easily trimmed and applied like other insulation products, with 16” centers. The sheets are sold by M-values that correlate with the number of BTUs stored or released as well as the weight of the material. 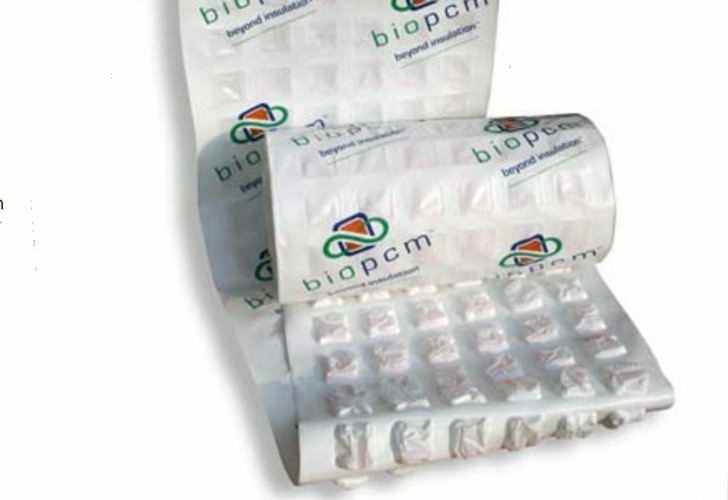 For example, a BioPCM sheet that rates M51, weighs a little over a half pound per square foot, and can store and release 51 BTUs per square foot in each phase change. Should a gel cell be punctured, the material inside each cell in the BioPCM sheet has a minimal amount of material, so not much can leak at a time, A nano element has been added to the bioPCM that gives the liquid material a firm gel-like consistency that mimimizes drips.